As demand for every square inch of space within London keeps rising in the unrelenting property gold rush, the city's realtors have had to find creative ways of packaging the ever-declining scraps of space remaining for non-oligarchs, in a fashion allowing the tenants to maintain their state of denial and tell themselves that the London lifestyle, for all its constraints, is still brilliant. 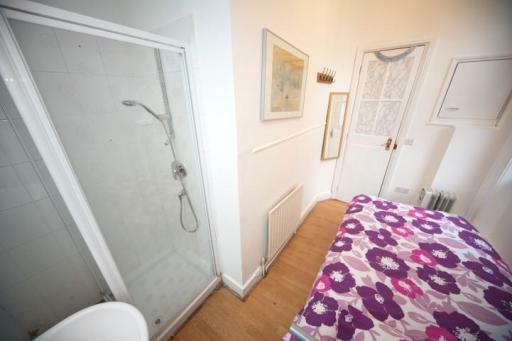 Case in point: this is apparently now a “studio flat” in London. 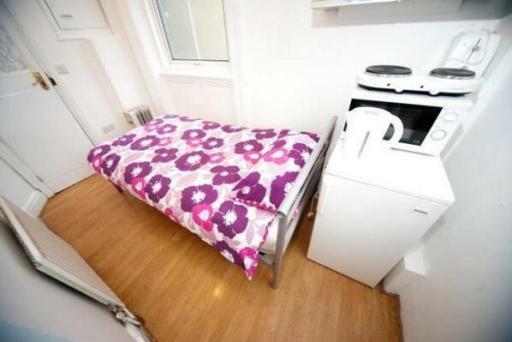 And for £130 a week, it, and with it a slice of the London life, can be yours. The flat itself is located in Earl's Court; if the name sounds familiar it's because, a few decades ago, it was known as “kangaroo valley”, and full of cheap houses inhabited by Australian backpackers. Now, of course, the only Australians you'd find there would be well-heeled legal or financial professionals. Even with the high dollar, your average cashed-up bogan would struggle to find somewhere to hang their boxing kangaroo flag up in the area. This phenomenon doesn't seem to show any signs of letting up; as long as London has its glamour (in the original mythological sense of the word, bewitching otherwise rational people into taking leave of their senses), as long as the world's oligarchs and princelings need a pied à terre in town and there are wealthy people in unstable places looking for somewhere safe to stash their wealth, the prices of land in London will keep rising. Meanwhile, for the UK's most active industries, Dubai-on-Thames is the only game in town, meaning that there will have to be some way of accommodating the non-super-rich within the constraints of the white-hot housing bubble. Of course, other places would suggest things like rent control or social housing, but that would be socialism, and socialism is wrong, so that's out of the question. So, assuming that the price per square foot of London real estate will keep rising, the London lifestyle will become, shall we say, increasingly space-efficient. The first thing to disappear will be collections of physical media. Granted, this has already started, with the rise of digital media and the decline of physical formats; the space crunch, however, will accelerate it. When all you need is a Kindle and an iPod (or maybe not even one of those; a broadband connection and either a Spotify subscription or a high tolerance for ads will do), shelves of books, records and DVDs become an expensive luxury. (Doubly so if the overheated property market compels one to pack and move regularly.) On the other hand, they could become a status symbol for those who can afford the luxury; we may see high-flying professionals and trust-fund kids lining their London Fields pads with EXPEDIT bookcases full of vinyl records, like something a DJ in 1990s East Berlin might have, just to show that they can. The shrinking size of modern technology will also help. We've seen hi-fi systems shrink from furniture to shelf-sized devices to ridiculously small plastic boxes. Desktop computers have gone from enormous under-desk towers to hockey-puck-sized devices; if those are still too large, a Raspberry Pi will browse the web just fine; or with a laptop, one can do away with a desk altogether and just use them on the sofa or the fold-away dining table. Televisions, meanwhile, can go away; an iPad held at arm's length will fill the same amount of one's field the roommates one's sharing with to make ends meet. Other parts of the average urban house will also shrink. Kitchens are already shrinking to kitchenettes, and may soon be replaced with just a bench with a microwave and an electric kettle (or, if that's still too much space, just an electric coffee maker); or not even that; at some point, it becomes more affordable to order takeaway every day than to rent the extra space to prepare anything more complicated than a mug of instant noodles. Adam Smith would undoubtedly have approved of such an efficient division of labour. Meanwhile, bathrooms with actual baths are a relative rarity, but there remain untapped potential efficiencies in how closely one can pack a toilet, a sink and a shower cubicle. (As space rises in price, perhaps architects will take hints from the designers of sleeper train carriages and introduce folding multipurpose units.) Meanwhile, bedrooms will see a revival of bunk beds (especially for those less-affluent renters obliged to share). Clothing, too, takes up space, which is where technology can help; dirt-shedding and odour-neutralising nanotechnological materials may some day make having multiple changes of clothing less necessary. Of course, if demand for a space in London continues to outstrip supply, shaving bits of space off here and there will not be enough, and one may soon see reconfigurable living spaces, along the lines of Gary Chang's famous Hong Kong apartment; all the various sleeping, eating and entertainment modules on sliding rails, with niches to store one's Kindle, iPad and three changes of clothing, allowing one to live a modern metropolitan aspirational-professional lifestyle in the most efficient of spaces. Tele-commuting is supposed to allow us to leave these overpriced, overcrowded CBDs and live in and work from cheaper satellite towns. Second Life has been around for 10 years now - let's get with the program people, and leave the capital! However some will ask: "What about my after-hours socila life? I need to be near the action." Therefore we need tele-socializing as well. I guess Facebook is this already, but how about hooking up multi-user audiovisual hangouts for punters scattered around country town to be virtually together at music gigs, birthday drinks at pubs, or Saturday morning espresso at groovy cafes? Telesocialising already is a thing among teenagers and kids; as the range which kids go unsupervised from their homes has shrunk over the decades (because of sensationalist media and distorted risk perception), kids hang out on Skype/WhatsApp/XBox Live. When those kids become aspirational twentysomethings, how much they value paying through their noses for a shoebox in the inner city may be quite different from the generation before them. Of course, cracking open a can of beer from the fridge in one's suburban living room is a far cry from having a pint in a copacetic pub somewhere central. I for one will be sad to see the restaurants, bars and cafés close as we enter the Stay-At-Home Century. But then again, I'm Old.